Get back to the game as Run 2 is finally here, guys! Like the prequel, you will continue taking control of a little gray alien in this adventure. The goal is to complete all levels without causing any fail. Before starting the journey, players need to choose to accompany either a running alien or a skating alien. What is the difference? Runner is easy to navigate, cannot jump far though. Skater, on the contrary, is able to jump farther yet harder to control. 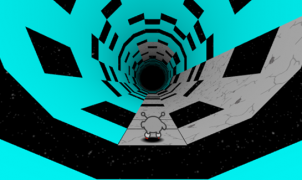 When you already pick your character, bring him to an endless tunnel and direct him to run like there’s no tomorrow. In each level, you have to do two important tasks – 1/ Jump and dodge over holes and 2/ Collect gold coins. While running/skating through the 3-dimensional course, you can also rotate the platform 90° to avoid fall into the abyss. The more coins you gather the more bonuses you will achieve. As the game progresses, the speed will become faster and faster. Besides the existing levels, you can create a brand new level to play – this is what I like most when relishing Run 2 game. Play this game with the keyboard and interact with the mouse. Note that Run 2 allows you to alter the key controls! Like Run 1, this sequel is created by Joseph Cloutier, a US-based developer. Play the Flash game here in any of your web browser. If you enjoy Run 2, also check out other running games like G-Switch 2, Angry Gran Run and Island Runner at our game site.